Booking into 2020!! Don't miss this wonderful vacation spot!! Sip in the Seattle skyline year-round from the covered porch or the belvedere dramatically perched above the bluff. This sought-after peaceful location is just a couple miles from downtown Bainbridge Island and the Seattle-BI ferry. Breathtaking high-bank waterfront view~the 3-story Skyline House is centered across the Puget Sound from downtown Seattle, sweeping to the right is Mt Rainier & the tip of Wing Point! Wrap around decks feature comfy, cozy furniture and a hanging swing...ensuring you can find the perfect hide-a-way spot to relax. Prefer to enjoy the sun? Just head out to the backyard where a beautiful oversize hammock is available as well as a playset for any little ones on the lush green lawn. Inside you'll find beautiful hickory hardwood floors and a paneled study (with stone fireplace), with every room containing elegant northwest decor to enjoy. Indulge in beautiful views of the water, the emerald city and Mt. Rainier from the basement windows all the way up to the master bath! The Skyline's Home architect made sure that even cooking dinner includes a a panoramic view! The details of the Skyline house make the guests feel cozy and at home. Following dinner preparations in a chef's style kitchen, you and your guests can feast at the 10+ ft. restored sycamore tree dining table for 10 in the separate, elegant dining room. As owners, we almost tear up each year we have to leave and promise you'll fall just as in love with the Skyline House and the wonderful Bainbridge Island area! We spent 3 years looking for the Skyline House. The view of Seattle and Mt. Rainier stole our hearts during our dating years and we just never tire of the area. It's heaven on earth for nature lovers! We hope to someday retire on BI and spend every minute here! In the meantime, we enjoy sharing this wonderful peaceful home with fellow vacationers. Sitting on over an acre, the Skyline House has plenty of room for outdoor play and exercise for little ones or you can just enjoy each other's company or the company of friends lounging on the outdoor 2nd story porch while enjoying the view of the Seattle skyline, Puget Sound traffic, the Cascades and Mt. Rainier. If you're lucky, you'll even see the whales passing through! Enjoy hearing the high tide waves crash against the beach while sitting on the 2nd story back porch off the study, porch swing or while roasting marshmellows in the backyard firepit area by the bank. Absolutely stunning views of Mt. Rainier and the Cascades from the backyard, the swing on the porch, over-sized hammock or even when cooking in the kitchen! The Skyline House features a beautiful view of the Seattle skyline (directly across the Puget Sound). Beautiful by day & breathtaking at night when the skyline sparkles like diamonds across the water! The Skyline House is a high bank oceanfront property. There is beach access at Hawley Cove Park or BI Waterfront Park in town - both only a mile or two away - but not directly from the property. Beautiful view of the Puget Sound and also bank side lounging in the belvedere. Views also include Mt. Rainier and the Cascade Mountains. Absolutely Breathtaking...views even from the basement! No long distance calls available. Bedding along with extra "snuggly" blankets for lounging around the house provided. He laundry detergent may be required. Parking for 2 cars available in garage along with driveway and circular driveway parking. 2 car garage with automatic garage door. Free Wi-Fi is included during your stay. Bath and hand towels provided along with washcloths. Travel size shampoo and wash provided. Toothpaste and toothbrushes may be available if needed. Hi-speed wi-fi included with stay. Network and password info provided in Skyline House manual. Located in upstairs living room. Chilled, filtered drinking water available from refrigerator spout. Cooking must be done on oven racks only. PLEASE do not place cooking dishes directly on oven bottom as it can permanently damage the oven and create a fire hazard. Available for use during your stay. Coffee and condiments such as cream and sugar available. Also have hot tea maker and selection of teas. Beautiful view of Mt. Rainier and the Seattle Skyline while cooking. The kitchen nook area seats up to 6. The formal dining room area seats up to 10.
xfinity cable service - pay per view selections not included. Will be deducted from the guests' deposit. Located in cabinet in upstairs living room area. Various books available during your stay - located in the study. Also fun books for children upstairs and a treasure chest with surprises for our little guests! Various games located in basement utility room cabinets. Toys fill a fun area under the basement staircase just for our little visitors! PS4 system located in basement living room area. Loving swing to enjoy while taking in the view. Belvedere overlooking water with lounge chairs. THE HOUSE WAS GREAT WITH LOTS OF ROOM FOR ALL ON MY 70TH BIRTHDAY. ALL OF OUR GUEST REALLY ENJOYED THE LOCATION AND THE AMENITIES. WHAT A GREAT LOCATION AND THE HOSUE WAS SO NICELY FURNISHED. IT WAS LIKE BEIING IN YOU OWN HOME. WE LOVED THE LOCATION AND THE HOUSE. WE WE RETURN AGAIN. THIS HOME DESERVES FIVE STARS FOR SURE! THE LIGHT OF SEATTLE WERE AWESOME! loved Skyline House. Beautiful house on a beautiful location. Great views of Seattle and surrounding area including Mt. Rainier. Very relaxing to sit and watch all the activities in Puget Sound. We saw orcas and bald eagles along with lots of other birds. House was fully equipped and very comfortable. We had an amazing stay for a family get together. The house is very well-equipped in the kitchen and has everything you could need to relax together with your family. Close to the ferry, beautiful views! Would definitely stay here again! We had a lovely weekend stay for a birthday/friends reunion on a snowy weekend. The views from the house were spectacular, and the house itself is beautiful and decorated nicely. It was a perfect location for a special weekend, and the owner was incredibly helpful given the inclement weather and very welcoming to us. Everything in the house was top notch, worked well, and there was helpful information located around to answer questions about the house. The only thing I'd suggest is that there be a real bed and mattress in the basement bedroom rather than the pull-out couch. A real bed always feels more comfortable and easier for guests than any pull-out mattress. Highly recommend this house! Great experience! 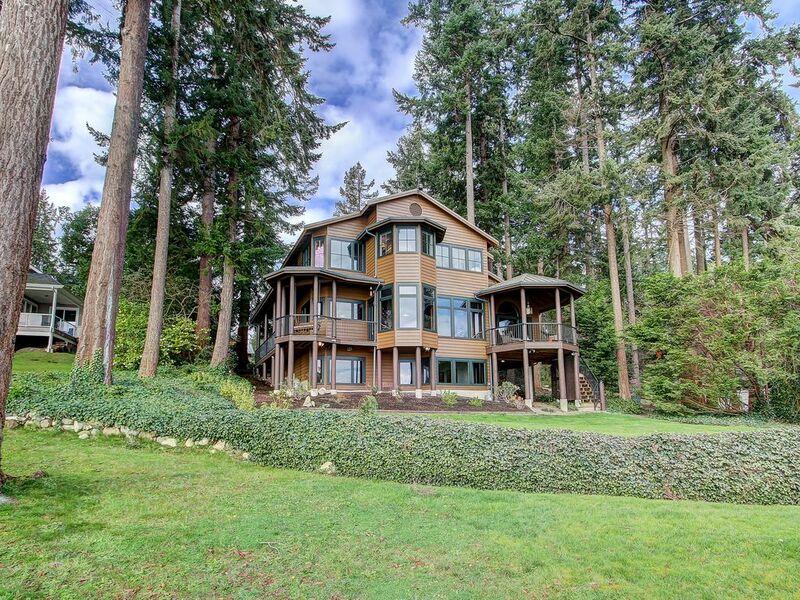 The home is beautifully appointed in addition to the stunning views of downtown Seattle and Mt. Rainier, and close to town, but far enough way to enjoy the quiet beauty of the Sound. The grounds are lovingly landscaped with a play set for the kids, and the balconies offer the perfect respite to take in the ships and boats as they sail past, and eagles landing in nearby trees. We can’t wait to return. Enjoy the outdoor sport court with basketball goal, swing set in the backyard or just sit by the high bank water's edge under the cover of the peaceful belvedere. Guests can also enjoy seating on the back porch or porch swing that has breathtaking water and mountain views! And, for the griller in your family the view while grilling on the 5 burner grill (includes sear and side burner options for cooking) placed just outside the kitchen for convenience will never disappoint!